Direct-Fit radiators for vehicles with LS engines with manual transmissions. Inlet and outlet are on the passenger side. Features factory type press formed end tanks, dual row core, and serpentine fins. Provide 30% more cooling than the stock copper unit at half the weight. 1955-57 Chevy Fullsize cars feature a 16 single-spal fan, all other applications feature an 11" dual-spal fan. It is epoxy free, and will fit into the stock core support. 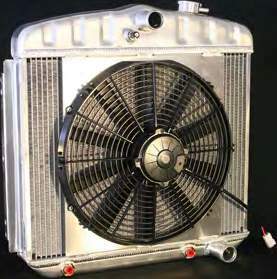 Aluminum plate style coolers will offer twice the cooling of the OE Copper style coolers. Transmission cooler is located on the passenger side. 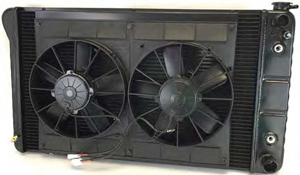 DeWitts is the only manufacturer that can integrate an internal dual-flow cooler. For automatic transmission, use A instead of M for part number ($30 upgrade). AT90-125-CLR-2 1.25" OD 90 degree bend aluminum tube, 16 gauge w/6" leg & 2" clear, ea. AT90-150-CLR-2 1.50" OD 90 degree bend aluminum tubing 16 gauge w/6" leg & 2" clear, ea. HTSEC90-125-BLK 1.25" OD 90 degree bend black elbow coupler, 4-ply reinforced silicone, ea. HTSEC90-150-BLK 1.50" OD 90 degree bend black elbow coupler, 4-ply reinforced silicone, ea.